The East Africa Dairy Development program successfully used the volun­teer farmer trainer (VFT) approach in Kenya, Rwanda, and Uganda. 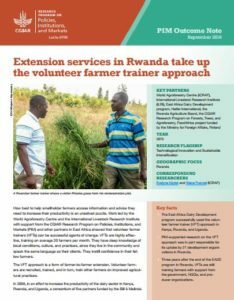 PIM-supported research on the VFT approach was in part responsible for its uptake by 21 development organi­zations in Rwanda. Three years after the end of the EADD program in Rwanda, VFTs are still training farmers with support from the government, NGOs, and producer organizations. How best to help smallholder farmers to access information and advice they need to increase their productivity is an unsolved puzzle. Work led by the World Agroforestry Centre and the International Livestock Research Institute with support from the CGIAR Research Program on Policies, Institutions, and Markets (PIM) and other partners in East Africa showed that volunteer farmer trainers (VFTs) can be successful agents of change. VFTs are highly effective, training on average 20 farmers per month; they have an in-depth knowledge of local conditions, culture, and practices; and they live in the community, speak the same language, and instill confidence in their fellow farmers.